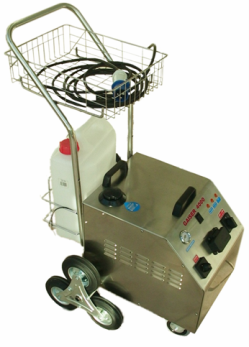 The Aquaclean Gaiser Gumblaster is a medium to heavy use industrial steam cleaner. It is designed specially with the need for chewing gum removal incoporating a long steam lance & star 3 wheels for easy up & down stairs & kerbs. The continuous refilling system means that the machine doesn’t need to cool down for refilling making it ideal for long periods of use this is thanks to dual tank system (water & boiler). It has a tough stainless steel body, stainless steel boiler, & accessories storage basket, which makes it suitable for tough gum removal / cleaning / disinfection tasks both indoors & out.